Located in the charming and popular Traverse City, Michigan area, this unique housing concept combines the beauty of open space with the warmth of community living. The three-phase project incorporates three different housing options (see Development Highlights) that include clustered housing, traditional neighborhood lots, and larger rural lots, while maintaining the rural character of the area. Over 50 acres of the property will remain as common open space for the enjoyment of all residents. The property is in Long Lake Township, Michigan, near great schools, libraries, and medical centers. 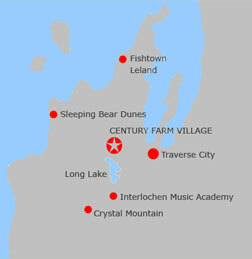 It will appeal to all generations: young families looking for country living with room for their children to explore, empty nesters who prefer a walkable community with many nearby neighbors, or buyers simply looking for a vacation getaway close to the amazing attractions of the Grand Traverse Bay Area. These 110 picturesque acres also offer spectacular vistas, mature woods, open fields, biking and hiking trails, a community building, and separate storage facilities for boats and other large "toys." If you are a builder or developer looking for an opportunity in the Northwestern Michigan area, please contact us.